President plays down the recent political turbulence linking high-ranking officials to bribes and corruption during international investor forum. SÃO PAULO, BRAZIL – Trying to attract investors to the country, Brazilian President Michel Temer told a room full of foreign investors on Monday that Brazil has surpassed the worst recession in decades and is now on the road to economic recovery. 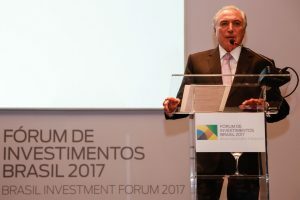 President Michel Temer at the opening of investment forum in São Paulo on Monday night, photo by Marcos Corrêa/PR. “Brazil is back. Inflation is under control, we created conditions for the responsible reduction of interest rates and the economy has grown again, employment begins to recover. And we left behind, ladies and gentlemen, the greatest recession in Brazilian history,” said the President during the opening of the Forum of Investments Brazil 2017 in São Paulo. Along with Temer, several key cabinet members of his Administration including Finance Minister Henrique Meirelles, Planning Minister Dyogo Oliveira and Agriculture Minister Blairo Maggi, were at hand to speak to mega-investors. The Forum, which brings together investors from more than 42 countries and 22 sectors of the economy, was created to promote meetings between government officials and private companies. Discussion sessions are scheduled to present to foreign and Brazilian investors different sectors of the economy, aiming to attract more investments, especially in infrastructure, agribusiness, energy and health. During the dinner event, President Temer tried to play down the recent political turbulence caused by statements made by executives from meatpacking giant JBS. “Brazil is much bigger than all these circumstantial, incidental challenges that have occurred in recent times,” said the President. Plea-bargaining agreements by JBS executives revealed million-dollar bribes paid to high-ranking politicians and a recording that showed President Temer supportive of payoffs to former Chamber of Deputies President, Eduardo Cunha, for his silence.